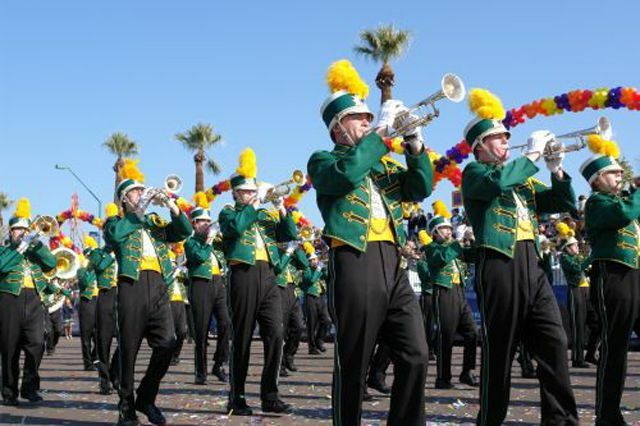 The Fiesta Bowl Parade is one of the most popular Fiesta Bowl events that take place in the Valley of the Sun in the weeks preceding the annual football game. Each year thousands of people line the streets of central Phoenix to cheer as floats, giant balloons, horses, celebrities, and bands pass by over the two-mile parade route. The parade will begin at 10 a.m. local time on Saturday, December 29, 2018, at N. Central Ave & W Montebello Ave in Phoenix, AZ. The parade route starts at Central Avenue, just north of Montebello Avenue. The floats then travel south to Camelback Road, east to 7th Street, and then south again to the finish just south of Minnezona Avenue. There are usually about 100 entries, including floats, balloons, bands, equestrian, specialty groups and honorary participants, including this year's Grand Marshal. Prior parades have featured duck races, Centennial Legacy Buffalo Soldiers, Hall of Flame Fire Trucks, and balloons like Earnest the Piggy Bank and Peek-a-Boo Cactus. The Fiesta Bowl Parade is free. Attendees simply find an open place along the parade route to watch the show, but there is also reserved seating at Missouri & Central, with tickets at $30.00 each and $10.00 for reserved accessible seating. Tickets can be purchased online or by phone at 480-350-0911. The parade will also be streamed live at azfamily.com or on the 3TV News mobile app. The live stream will be hosted by newscasters Scott Pasmore, Olivia Fierro, April Warnecke, and Javier Soto. To avoid the traffic (and finding a parking spot), take public transportation. Mass transit options are available via Valley Metro Rail with the Central/Camelback station best for easiest access to the parade. The Arizona Department of Transportation provides detailed motorist information, including any travel or road restrictions, for the event. Learn the latest traffic updates by calling 5-1-1, then *7. The call is free. Street parking will be difficult to find, and meters are not free on the weekends. There will be parking lots charging fees in various locations all along the parade route. It is highly recommended to ensure parking on the side of the parade route that you want to leave from—it may be difficult getting around the parade route for several hours after it begins. Dress appropriately for the local weather in Phoenix for late December and early January by wearing layers and wear comfortable shoes to stay comfortable. The best views along the parade route for those not sitting in the reserved bleacher seats are at Central and Camelback or 7th Street and Camelback. There is pre-parade entertainment at both of those intersections. Get there pretty early to snag a good spot; people arrive several hours before the start of the parade with some claiming spaces as early as 6 a.m.
Bring chairs, snacks, water. Remember, it will be cool in the morning if you plan to get there early. There are restrooms all along the parade route. Note that all dates, times, prices and offerings are subject to change without notice.